When it broke a year ago, the reported attempted kidnapping of a teen girl was horrifying enough. 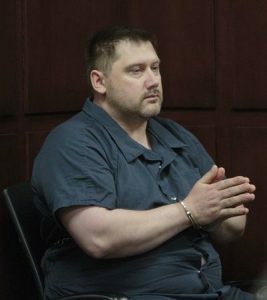 Little did anyone know at the time, that it would trigger the arrest of Jeffrey Willis for two even more horrific crimes and possibly solve one of West Michigan’s saddest mysteries in recent memory – that of the disappearance of Jessica Heeringa. It was the morning of April 16, 2016. A woman called 911 central dispatch to report she had a terrified and hysterical teenager in her house – that the girl had jumped from a moving van and ran to the woman’s home. And so began an investigation that police and prosecutors say solved the mystery of what happened to Heeringa, a gas station attendant abducted and allegedly killed, three years earlier, as well as the bizarre apparently random shooting death of jogger Rebekah Bletsch in the summer of 2014. What follows is a chronology of how the kidnapping report triggered the investigation into Willis, resulting in his arrest a month later, and the development of investigators’ theory that his motive in all three crimes was sexual torture. Information was culled primarily from testimony during preliminary examination hearings. Willis’ trial dates have not been set. A 16-year-old girl tells police she became lost on West River Road in Muskegon County’s Fruitland Township while walking home from a party. She was in tears when a man in a silver minivan pulled over and offered her to use his cell phone. She climbed in his van, he took off and informed her the cell phone wasn’t working and then pointed an orange-tipped gun at her. Alarmed, she ended up jumping from his van and running. She told police he stopped the van and told her he was just kidding as she ran. Police said they later recovered bullets on Green Creek Road at the spot the girl said she jumped from the van. Following the kidnapping report, police alert the public to be on the lookout for a silver minivan, which also was the vehicle described by a witness in Heeringa’s disappearance from a Norton Shores gas station three years earlier. Ten days after the reported abduction, Muskegon County Sheriff’s Det. Matt Schultz discovers a blueberry farm near the reported abduction site has surveillance cameras. Examination of the video locates images of the suspect van which are enhanced to determine its make, model and unique characteristics. Police determine Willis owns a van matching the description and his photograph is shown to the teen. She identifies him as her alleged kidnapper, and Willis is arrested for her kidnapping on his way home from work on May 17, 2016.